Commemorate your special song with a stunning A3 poster! We all have many special songs in our lives. Your first dance, your wedding song, memories of loved ones, songs which defined a certain time in your life like school/student days the list goes on and on. The Poster includes your choice of song title and artist on record and CD art which you can personalise with your choice of name or names and a message. It comes printed on high gloss paper and is beautifully bound in a black frame which is ready to hang. Measures 12 by 16 (30cm by 40cm). 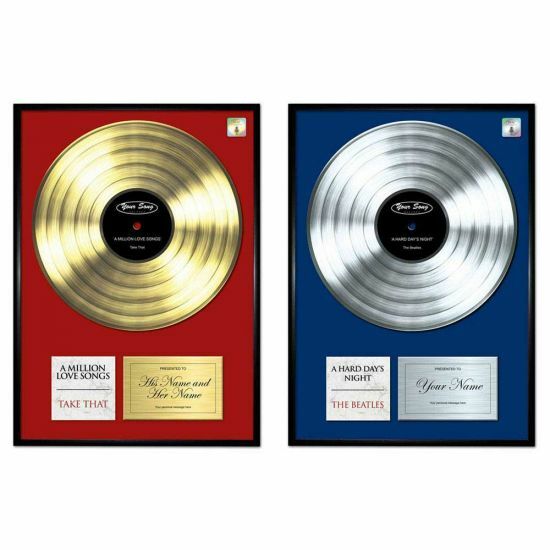 Perfect for individuals and couples and makes a wonderful Engagement or Wedding present or anniversary gift and comes in either Gold and Platinum disc artwork. However, please note this DOES NOT include the actual disc or CD if it's a favourite, we would assume you would already have that anyway! Whether it's something sentimental and slow or loud and upbeat, it's your choice!